The United States Football League begins its second season in two weeks, but Donald J. Trump, who has become the biggest and most visible wheeler-dealer in all of sport since buying the New Jersey Generals in September, is already looking forward to what he calls the Galaxy Bowl. The Galaxy Bowl? Yes, the Galaxy Bowl. According to Trump, who thought up the name, it would pit the USFL championship team against the winner of the NFL's Super Bowl. As Trump sees it, the first Galaxy Bowl would take place perhaps three years from now, when the NFL's TV contracts come up for renewal, or maybe even sooner, depending on whether the USFL switches from a spring to a fall schedule. For Trump, the question of switching to a fall season isn't if but when. As he puts it, "I see different scenarios, but that happens to be the scenario I favor." This may sound like brash talk, but no one, including his critics, has ever accused Trump—who once hung a huge banner across the front of Grand Central Station with TRUMP in block letters—of thinking small. A 37-year-old multimillionaire developer who has deftly swung from one vine to another in the political jungle of New York real estate, Trump is used to getting what he wants. He has the buildings to prove it, such as the Grand Hyatt Hotel (which features a restaurant called Trumpet's) and the new Trump Tower, sheathed in bronze and glass, a structure combining stores, offices and condominiums, on Fifth Avenue next to Tiffany's. Affable and boyishly handsome, Trump and his blonde wife, Ivana, a Vienna-born former competitive skier and model who gave birth to their third child on Jan. 6, have recently been the golden couple of newspaper style pages. They dine at tanned goatskin tables in their own Manhattan condo overlooking Central Park, wear designer clothes and ski in Aspen, Gstaad and St. Moritz when not weekending at their Greenwich, Conn. estate. "Donald's brilliant," says Ivana, an executive vice-president in charge of interior design for the family-owned Trump Organization. "As a lot of people say, whatever he touches turns to gold." Trump skis and plays an occasional game of golf or tennis, but he has no deep interests aside from his family, real estate and the Generals. "I like to create," he says. "I like to create great things. I don't go after money for money's sake. Money is an offshoot of what I do." As might be expected, the Trumps travel in rarefied circles. Dr. Norman Vincent Peale is their pastor, Roy Cohn their attorney. "Donald Trump is an extraordinary young man," says Peale. "He has the elements of genius." Cohn says Trump is "one of the most enterprising, ingenious businessmen on the American scene...a miracle man who can't seem to make a mistake even if he tries." Given his record of success, Trump finds it no big deal to tackle the NFL head on. "I could have had four or five NFL teams," he says, but he bought the Generals, who were a dismal 6-12 their first season despite having Herschel Walker, because "I like a challenge." Trump adds, "People look at certain institutions, like the NFL, as being infallible when they're not. When the AFL started, the NFL was supposedly indomitable. Then people realized the AFL was playing a more interesting brand of football than the NFL. Now, in a different decade, there's going to be a similar thing happening, only something more exciting. Institutions are sometimes the most vulnerable elements of our society, and the NFL is very vulnerable." created." But Trump's love of publicity goes way beyond business. Publicity makes him as excited as a kid. When the New York Post held a sports forum in December featuring George Steinbrenner, owner of the Yankees, Sonny Werblin, then president of Madison Square Garden, Fred Wilpon, president of the Mets and newcomer Trump, it was Trump who got most of the attention, and he was exultant. "Did you see the picture on the front page of the Post?" he asked. "It wasn't Steinbrenner and Ed Koch. It wasn't Sonny Werblin and the mayor. It wasn't Fred Wilpon. It was Donald Trump and Ed Koch." Scarcely a day goes by without a Trump deal trumpeted all over the papers or TV. He boasts that the Generals, a team that had "gotten no ink," received more coverage last fall in New York than the NFL did while its season was under way. Trump created hoopla with stories that he was negotiating with Don Shula of the Dolphins to coach the Generals, and when the Shula deal didn't pan out (Trump says Shula asked for the unaskable, a condominium in Trump Tower), he created more to-do, at least locally, by hiring Walt Michaels, who formerly coached the Jets. Trump also grabbed headlines by raiding the NFL for players, most notably Brian Sipe, the Cleveland quarterback whose passing is supposed to open up the Generals' running game for Walker. Most recently, Trump massaged salt into the wounds of the NFL after signing Lawrence Taylor, the Giants' super linebacker, to play for the Generals starting in 1988. When the chagrined Giants subsequently offered Taylor a huge raise and a new long-term contract extending beyond 1987, Trump, saying he had no wish to hamper Taylor's career, sold Taylor's Generals contract back to him for $750,000 of the Giants' money. "It was a very creative deal," says Trump, who then signed Freddie Gilbert, a defensive end from Georgia who would have been a high-round choice in this spring's NFL draft. A relative newcomer to Manhattan, Trump has been triumphant in real estate deals ever since he left the family's home turf in Brooklyn and Queens in 1973. In partnership with the Hyatt Corp., he gutted the bankrupt Commodore Hotel next to Grand Central Station to build the glittery Grand Hyatt, now one of the most heavily booked luxury hotels in the city. To the anger and dismay of established hoteliers, he got a 40-year tax abatement now valued at more than $150 million from the city on that property, because, he said, the project would help rejuvenate East 42nd Street. In partnership with Equitable Life, he tore down the Bonwit Teller store at Fifth Avenue and 56th Street to build the $200 million Trump Tower, which he says is 68 stories high. Trump Tower has a six-story marble atrium, complete with two bronze T's 3½ feet tall and a six-story-high waterfall. The doormen wear summer uniforms with pith helmets like Bahama cops and winter uniforms modeled on those of the Household Cavalry at Buckingham Palace, right down to the fur busbies (Ivana Trump had the uniforms tailored in London), and a pianist (and occasionally a violinist) plays Cole Porter and Gershwin in the lobby. Trump has gone to court to get a $50 million tax abatement for Trump Tower. "The city has always given a tax abatement to anyone who built a residential building," Trump says, "but because of the wealth of the people in the building, or whatever, the city doesn't want to do that now. Aristotle Onassis got it on Olympic Tower, so Donald Trump should get it on Trump Tower." Trump's office on the 26th floor has a splendid view of Central Park. The view will never be blocked because he bought the air rights over Tiffany's for $5 million. "I always like going first class," says Trump, whose office furnishings include a marble football with a bronze plate inscribed DONALD J. TRUMP/OWNER/NEW JERSEY GENERALS/USFL/1984, which was given to him by the company that did the marble work for Trump Tower. Trump says, "To anybody in real estate, there's an expression, 'Tiffany location.' Whether it's in New York, Paris, Los Angeles or Des Moines, Tiffany location means the very best. This is the Tiffany location. This is the best piece of real estate in the world. I've always invested in things of first-class quality. I believe in overpaying for the best—not the very good, but the very best." Curiously, Trump's 26th-floor office is directly across Fifth Avenue from the 19th floor of the Crown Building. That's because Trump arbitrarily numbered the upper floors in Trump Tower because the ceilings of the lower floors are higher than usual. The lower floors are rented out for offices and shops and command as much as $400 per square foot per month, well above the going New York rate—one tenant who sells leather goods pays more than $200,000 a month rent—while the condominiums starting on the 30th floor (really the 23rd floor) are priced from $600,000 to $12.5 million each, half again as much as the next most expensive apartments in the city. So far, Trump has sold 274 million worth of condos to such luminaries as Johnny Carson, Sophia Loren, Paul Anka, Steven Spielberg and the British Royal Family. That leaves Trump a mere $40 million worth of condos to dispose of. At present, Trump is finishing off Trump Plaza, a $100 million cooperative apartment house on East 61st Street, near Bloomingdale's, and he also is "building the tallest hotel-casino in the world, Harrah's at Trump Plaza" in Atlantic City in partnership with Holiday Inns, Inc. He estimates the profits from the hotel-casino will amount to $100 million a year. The odds are a billion to one against Trump's ever rolling the dice in the casino. He has never played a gambling game, and he is a lifelong nonsmoker and nondrinker whose strongest libation is ginger ale. Trump's critics are not so generous in their praise as are pastor Peale or counselor Cohn. Both Trump and his father, Fred, a onetime carpenter's helper who made part of the family fortune building publicly financed housing projects, have been accused of being politically wired for real estate deals. Both Trumps have made generous campaign contributions to city and state politicians, and Fred in particular was noted for his coziness with the Brooklyn Democratic machine that helped serve as a power base for former Mayor Abe Beame and former Governor Hugh Carey. In 1974 the Trump family gave $35,000 to Carey's election campaign, in '78 another $66,500. In '74 Donald hired Louise Sunshine, Carey's chief fund-raiser, to work for him as a lobbyist. 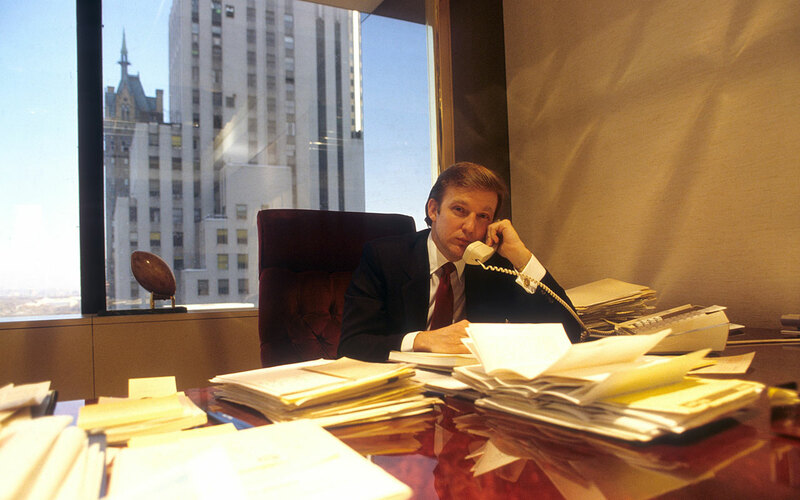 In '79, Wayne Barrett wrote a two-part series in The Village Voice on the Trumps as power brokers in which he quoted a representative of Penn Central as stating that Donald Trump had been picked to develop the bankrupt railroad's yards in mid-Manhattan because there was a need for a developer "who seemed best positioned in the New York market to get rezoning and government financing." The Penn Central man stressed that zoning is a "highly political activity in the city of New York." Trump denies he's politically wired, but he has been criticized on other fronts as well. In 1973, the Department of Justice charged that the Trump Organization discriminated against blacks in renting apartments. Donald Trump denied the charge. He did say the Trump Organization wouldn't give leases to people on welfare "unless they have guaranteed income levels, because otherwise everyone starts leaving the building." Trump later signed an agreement to provide housing opportunities for minorities. In 1980 he was denounced as an esthetic barbarian after he ordered the demolition of two Art Deco bas-reliefs on the facade of Bonwit Teller. The Metropolitan Museum of Art wanted the sculptures, but Trump, who was tearing down the building to make way for Trump Tower, said his experts deemed them worthless and that trying to save them for the museum would have cost $500,000 and endangered passersby below. "The funny, sad thing is that the publicity was responsible for sales of apartments in Trump Tower," Trump says. "The publicity caused interest in the building." More recently, columnist Sydney Schanberg of The New York Times accused Trump of trying to get rid of tenants in a building on Central Park South that he wants to tear down, by stashing vagrants in vacant apartments. Trump says that the tenants are multimillionaires with rent-controlled leases and that he simply was seeking to help the homeless. "Why should I leave a building with 20 apartments empty when I can put in people who are freezing in the streets?" he asks. Philip Hess, the counsel for the City Planning Commission, views the offer somewhat differently. "This is a case study of how Donald operates," says Hess. "He made this proposal—and it may have been tongue in cheek—with a serious strain of public concern. That concern was one in 100 compared to Donald Trump's interest to serve his own self-interest in that building. From my experience, it is absolutely par for the course." Even within the tight circle of Manhattan's developers Trump has his critics, and he is by no means the biggest developer in Manhattan. George Klein, who operates under the name Park Tower Realty, is bigger, but he doesn't court publicity. The same goes for the Reichmann family of Toronto, which goes by the corporate name of Olympia & York. What helps raise hackles is that Donald Trump gets all that publicity. "He's in love with himself," says one developer, who asked for anonymity. "He's always promoting Donald Trump. When he wants something, he doesn't permit anything to stand in his way. He doesn't have a regard for human feelings. I don't know a lot of his peers who have any warmth for him—there's a lot of broken china behind him—but they respect him. He does accomplish things. He's made Trump Tower the Number One building, the place to be, because of his ballyhoo. He's like a Steinbrenner. That's why he wound up with the USFL. He bought a team because he wants people to know who he is." Hess says, "Donald Trump is an extremely gifted self-promoter. The most important thing about him is his absolutely unshakable confidence in himself. Donald does things in a very public way. He arranges things so they become events, not just an announcement." With a smile Trump says, "My image is much different than I actually am. After people meet me, they get along with me. Before they meet me, it's negatives." Peale says, "Anybody who succeeds at anything is likely to be the recipient of jealousy. Reporters who talk to me about Donald view him as a tough guy. That's not the case. I'm in the people business, and this man is a gentleman. Every time you try to compliment Donald, he diverts the praise to his father or mother. Donald is an honest genius who, in my humble judgment, will go down as one of the greatest builders of our era. Anything that Donald attempts, he's likely to succeed at." Whatever praise or criticism comes Trump's way, it's important to note one thing: He has succeeded at every challenge he has set for himself. And no one knows this better than Trump, who readily recounts them all. Trump's recitation goes like this: "I've always undertaken jobs that people said couldn't be done. People said that the Grand Hyatt would never be built. Now they see it. They said that Trump Tower would never be built. Now they see it. "In life you have people who promote and those who manage," Trump continues. "I'd like to think that I'm somebody with both qualities. Take the Cabbage Patch doll. Great promotion. Poor management. For the past 10 years people have seen the Jets and Giants. I think the New York-New Jersey area deserves a winner. The Generals have become hot. The season-ticket sales could well top 40,000, maybe 50,000. [As of Feb. 5 they stood at 29,000.] We've created a stir. There's going to be a lot of excitement." Although Trump has indeed generated a lot of excitement with his signings, he's not intimately involved with the day-today operations of the Generals. He leaves that to the club's president, Jason Seltzer, and others in the front office. Seltzer, an attorney who worked on some of Trump's real estate deals, handled the negotiations with Sipe, Gary Barbaro, the All-Pro safety who jumped from the Kansas City Chiefs, and Lawrence Taylor, although Trump worked out the deal that netted him a profit on Taylor's contract. Trump says, "I have no wish to hurt the Giants or the Jets." That may be, but a Generals radio commercial pointedly contrasts the differences between his team and the lackluster Jets and Giants, asking, "Which professional football team in the metropolitan area has the best head coach? The Generals with Walt Michaels. The best running back? The Generals with Herschel Walker. The best quarterback? 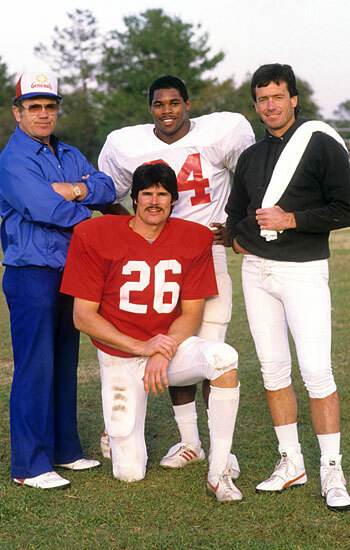 The Generals with Brian Sipe. The best defensive back? The Generals with Gary Barbara. The Generals have signed on the best, and now they're looking for you, the best football fan in the world...it's time you joined the ranks of the best." Donald Trump is of Swedish-German descent, but he says that many people think he's Jewish because his family owns so many buildings in Brooklyn. He is one of five children born to Fred and Mary Trump, who live in Queens, across the East River from Manhattan. Their oldest son, Fred Jr., died of heart failure three years ago. The family story reads like a saga by Thomas Mann. The master builder is Fred, whose own father died when he was 12. Now 78, Fred has a full head of red hair, a bristly mustache and an erect carriage. "The chicks think I'm 50," he says. He spends his time in his office, at 600 Avenue Z in Brooklyn, looking after his rental units. Manhattan is Donald's stomping ground, not his. After graduating from high school, Fred Trump went to work as a carpenter's helper. "Learn a trade, and you can always go back to it if things go wrong," he says. By the age of 20 he had built a one-family house in the Woodhaven section of Queens. In 1935, in the depths of the Depression, he put up 78 two-family houses in the Flatbush section of Brooklyn. Other developers had shied away because the area had been mined for sand and then filled with garbage, but Trump devised a way of putting in pilings to give the houses stable foundations, and he was off and running to a fortune. Fred and Mary Trump raised their family in Jamaica Estates in Queens. President Reagan recently appointed the oldest living child, Maryanne Trump Barry, a federal judge in Trenton. Elizabeth, the second-youngest, is an administrative assistant at Chase Manhattan Bank in Manhattan ("She's my friend at Chase Manhattan," says Fred, parodying a TV commercial), and Robert, the youngest, is an executive vice-president of the Trump Organization. Donald was fascinated with building from childhood. He played with building blocks and erector sets, and when he was 11 he built a balsa-wood model of The Highlander, an apartment house his father was erecting. "He liked real estate," says Fred. "He grew up in that atmosphere." When Donald was 12, his parents sent him off to the New York Military Academy in Cornwall-on-Hudson, just north of West Point. "They had what Donald needed," Fred says. "They're strict. They're stern, and they give a good education." He was concerned that Donald would become spoiled if he stayed home. "His friends were kids who'd give $40 baseball gloves for a birthday present," Fred says. "Donald wanted to give a boy a $40 glove for a birthday present. I said, 'Donald, Times Square Stores has gloves for $8.95.' He almost threw up. "That school really built him up in his formative years. He became a captain, and he marched in the Columbus Day parade. He had medals on like he won the war singlehandedly." After graduating from New York Military, Donald went to Fordham for two years and then transferred to the Wharton School of Finance and Commerce at the University of Pennsylvania, where he was first in his class. While at Wharton, he made money reconditioning buildings in Philadelphia, and after he graduated, in 1968, he returned home to take a supervisory job with his father in the Trump Organization. In 1973, Donald struck out on his own for Manhattan. The Manhattan real estate market was then depressed, and he figured the time was ripe to start making deals. "I bought a lot," he says. "As people were selling, I was buying. After '76 the market became hot again." He concentrated on the choice midtown area. He has studied it so thoroughly that he knows where basements interconnect, and there are sections where he can walk five blocks through maintenance rooms without going aboveground. Trump persuaded city officials to abandon construction of a new convention center on the Hudson River, where $37 million worth of work had already been done, in favor of a new site over the Penn Central yards near Penn Station. Trump held the option on the new site, but when the city refused to let him build the convention center (he wanted it named the Trump Convention Center), he made a $2.5 million profit on his option and moved on to construction of the Grand Hyatt. The city began building the convention center on its own, and the project is now more than two years behind schedule and $200 million over budget. "I would have built the convention center on time and on budget," Trump says. "Public agencies can't do the job. There's tremendous talent involved in being able to build on time and on budget." As Fred Trump says, "I always told Donald, 'If you dawdle, you lose your shirt. You pay interest 365 days a year.' "
Trump met Ivana in 1976 at a party in Montreal. Born Ivana Winkelmayr to an Austrian mother and a Czech father, she was raised in Vienna and moved to Czechoslovakia at the age of 14 when her father, an architect, had the opportunity to design sports complexes. In Vienna Ivana had been a promising swimmer, but in Czechoslovakia she gave up swimming to concentrate on skiing. She received her bachelor's and master's degrees in physical education from Charles University in Prague and is fluent in Czech, German, Russian and English. In 1972 Ivana was a member of the Czechoslovakian ski team, although she wasn't one of those chosen to compete in the Olympics in Sapporo, Japan. After the Olympics she went to Canada to stay with an aunt and uncle and became one of the top models in Montreal, while keeping her hand in at skiing by serving as an instructor at Jay Peak in Vermont on weekends. Donald and Ivana are a close team. Before he bought the Generals, he and his wife talked it over, because, as she says, "Owning a football team means the end of our Sundays." Ivana herself designed the Generals' cheerleaders' new uniforms, which she thinks are "fantastic." But Fred is unlikely to attend any of the Generals' games this spring in the Meadowlands. "I'm not a football fan," he says. "It's the challenge that drove Donald to do something with the USFL." Last month, the state Urban Development Corporation announced that it had formed a subsidiary to do a $1.2 million study on the feasibility of a new sports complex which would attract professional teams back to New York City. Donald Trump, who had already been scouting the city on his own for possible sites for a stadium, was named a director of the subsidiary, which will consider, among other things, a domed football stadium that could seat 100,000. In an editorial headed WE DON'T NEED A STUDY TO TELL US WE NEED A STADIUM, the New York Post said that politicians had botched their chance to deliver the convention center on time and on budget and urged that the state "let Trump get on with what only the Trumps of this city can do." On the basis of his track record, it's quite likely that Trump will build the stadium, and if his scenario for the USFL comes true, the chances are good that the Galaxy Bowl will be played there. Donald Trump has no doubt that the USFL will make it and make it big. To Trump, it's "absolute nonsense" that 1984 will prove to be the make-or-break year for the league. Pointing to neighboring skyscrapers from his office, he says, "There's ABC. There's CBS. There's NBC. They're all around me. They read that the Grand Hyatt would never be built, but it was. They read that Trump Tower would never be built, but it was. Now they see me buy a football team. They're gonna believe." Trump adds, "When I want something, I want victory, completeness, results." PHOTOTrump oversees his empire from a "26th-floor" office (psst, it's really on the 19th story). TWO PHOTOSThe Trump touch: dressing the lobby up with a piano player and an imitation Household Cavalry. TWO PHOTOSCounselor Cohn (above) lionizes his client, and pastor Peale praises his parishioner. PHOTOHess has a handle on Trump's maneuverings in Manhattan. PHOTOVienna-born Ivana, once a competitive skier, was a Montreal model when she met Trump. PHOTOThe major Generals: Michaels, Barbaro, Walker and Sipe.